We had a nice, quiet holiday at home. Ryan had to work so it was just the girls, my mother-in-law and I. Having my mother-in-law here is bittersweet - she and my father-in-law planned to share Christmas with us. It has been several years since we spent Christmas together. He passed away September unexpectedly in a boating accident over the labor day weekend. It was very difficult not having him here to share in the celebrations but my MIL did remarkably well. She received a new camera and GPS from all the kids. My FILs camera was ruined in the accident and the GPS he had was in his car, which she sold. She was so happy that she received the two things she really wanted. The girls LOVED all of their goodies. They received many things tailored to their own individual tastes. Miss C is a teen so she received clothes, jewelry, and beauty items. Miss N. loves art thus she received many arts and crafts. Miss E. is a reader. Although she received many larger gifts, her favorite gifts from Santa were 2 wonderful books by Shel Silverstein. Even though considered classics, I never owned these books as a child - they are new to me also! We are having a blast reading the wonderful, wacky, whimsical and humorous poetry. Miss N. also had a birthday ON Christmas. This birthday was a special one so she received more gifts than usual. (Typically the girls receive more at Christmas than on birthdays). Her best gift? A surprise phone from her dad. It was a surprise for me also! Ryan also surprised me with a few nice gifts - a DVD set of the 1st season of Glee, the new Eclipse DVD and 2 pairs of "Not Your Daughter's Jeans". The jeans were wonderful because Miss N. ruined the one pair I owned when she came back from a tye-dye b-day party and placed her shirt on top of the pants. Best of all I received Just Dance 2. The girls and I have been having a blast playing it. I love most of the new songs but the game is definitely more difficult than Just Dance 1! My parents gave me a camera. I was thrilled - Our family camera is just not very good. It was a quick and inexpensive replacement for one that broke. When I have been attending blogger functions and all of the other bloggers bring these great cameras to document the experience and all I have my iphone. I just love the cranberry sauce. We have a plain Junior's cheesecake at home. I topped my slice with a couple teaspoons of the homemade cranberry sauce and it is SO yummy! I hope everyone had as lovely of a holiday as ours. Please feel free to share links to your blog posts of festivities in your home/family or recipes. Raleigh was blanketed in snow yesterday - gorgeous! We did get dumped on but not nearly as bad as other areas of the country! 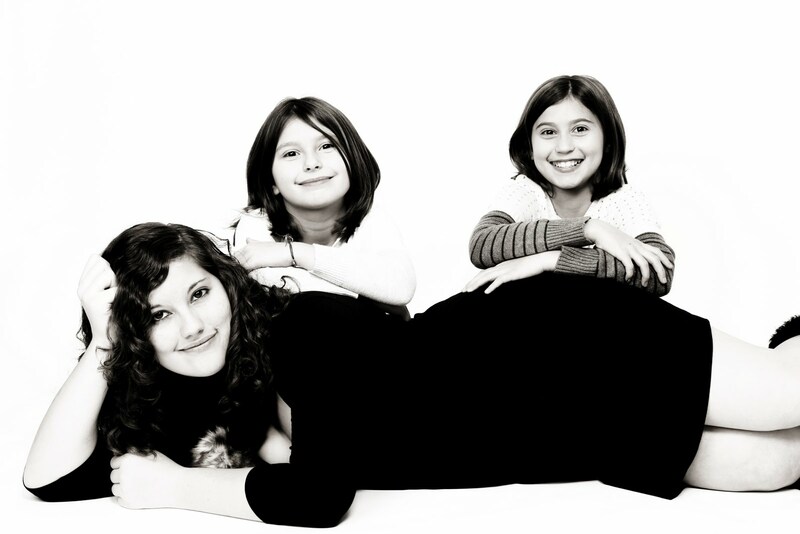 Here is a picture of the girls taken by Tina Loebach with Loebach Studios Photography (Raleigh, NC). I won a photography package from BabyPhotographers.com from a Blog Promotion via Team Mom. Tina specializes in Wedding, Baby and Boudoir photography. This is one of the best things I have ever won - Tina did a fabulous job!!!! 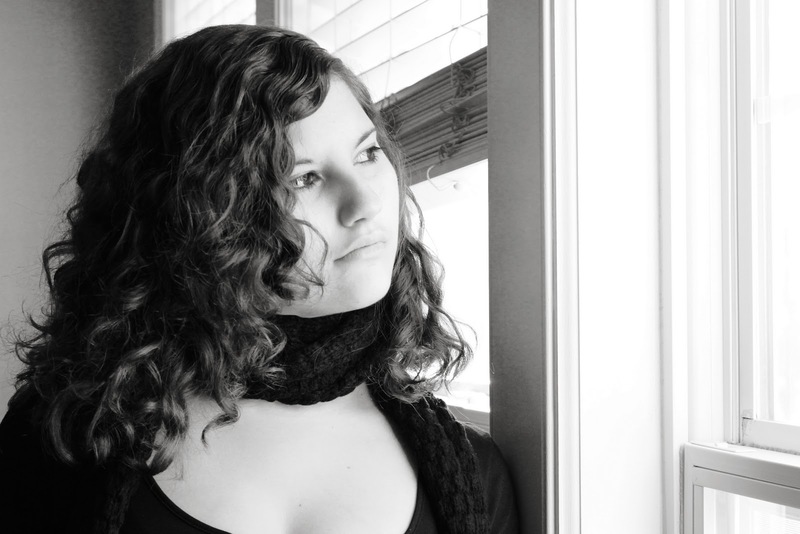 Outside of portrait packages in retail stores, I have never had the girls pictures taken professionally. This was such a wonderful experience and I plan to go again :) If you are local to the Raleigh, NC area, I highly recommend her. Today we went to the Wake Forest parade. To be honest I was dreading it. Usually anytime we go to any large event my DH drives. He is much better than I am at arriving where we are supposed to, finding good parking and getting us out of there quickly. I am not. He had to work so I was the designated driver. The girls were supposed to get dropped off at the back of the post office. We ended up walking and found everyone in the front. By then we were about 15 minutes late, but hey - we found it. I was happy. I only had to go around the block twice. That is pretty good considering I had no idea where we were going and everything was starting to get blocked off. Miss C. and I dropped the little girls off and headed out back towards the main street of historic Wake Forest. I took her out to a Tea House for Scones and Tea. I love the tea house - I am a tea drinker and love the charming and quaint ambiance and enjoy the scones with Miss E. and Miss N. loved the Tea House when I took them a few months earlier. Miss C. did not. Apparently tea is not her thing. Our stay was brief - no more than 20 minutes. We went to The Cotton Company for a little shopping. The shops are darling - they have a wide variety of items. I picked up some soy votive candles and some last minute gifts. We then headed out to find a spot at the side of the road. It was cold and rainy outside. I was glad that we were able to stay warm during our wait but it was at the expense of getting a good seat. The positive was that we WERE at the very front section of the parade with street side seating (except that we were actually standing). The negative was that there while were several buildings with awnings, these areas were already full with early birds. We did not have an umbrella so basically we got rained on. I was just thankful that Miss C. and I both had gloves and hats. The girls were one of the earlier groups to come out. A few groups were in front, including ROTC, Boy Scouts, friends of the Wake Forest Library - including the bookmobile, 2 other girl scout troops, a dance troupe, the United Methodist Church, etc. 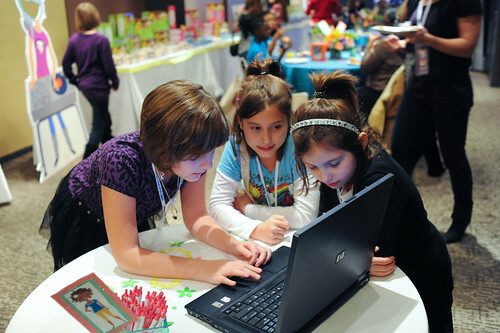 My girls are in sister troops which is very convenient - their meetings are the same date, time and place and most of the activities are as well. As such both groups of girls were walking together - Miss E. with her Brownie troop and Miss N. with her Junior troop. As soon as the girls passed, Miss C. and I ran over to the other side where the parade ended. Shortly after the girls walked by again. I quickly grabbed them and ran to the car. We were cold, wet and miserable. I have to give credit to all the kids in the parade - they really hung in there! Unfortunately I parked in a bad spot - we could not get out as there were still groups entering the parade one one side and there were groups departing the parade on the other. We were smack dab in the middle. All we could do was wait until we could finally leave. I blasted the heat and took pictures of myself with my camera phone (I need a new profile pic). The girls ate candy canes, took off their shoes and socks and argued. Miss C. texted on her phone. Finally the parade ended and we were able to head home. When we arrived home is when the real celebration again! Next year I will be a little more prepared. 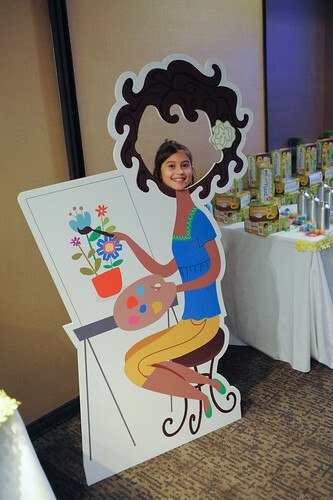 NYC Crayola Pop Art Pixes Blogger Event - Meet the Pixies! The professional photos have finally been added so I have some pictures to show from our trip. Late last month, November, 2010, Miss N., Miss E. and myself were invited to attend a Crayola Pop Art Pixies premiere Bloggers event in NYC. All I can say is the people at Crayola are FABULOUS! We had such a wonderful time!!! 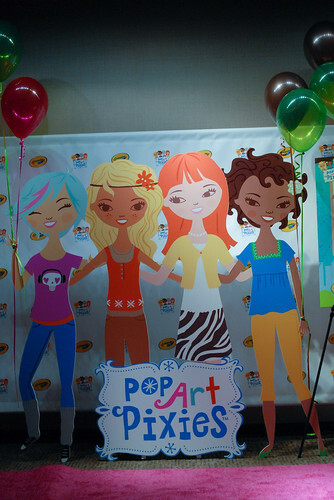 Prior to the event the girls and I created Pop Art Pixies online. 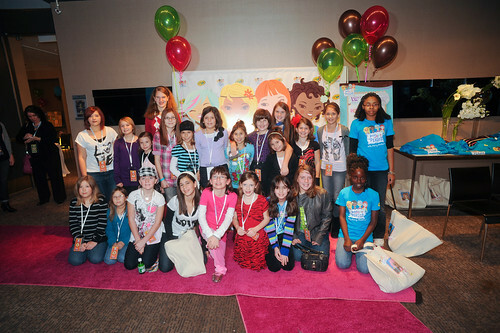 The girls also received gift cards to select new outfits to match their favorite Pop Art Pixie. Miss N. went casual in jeans and a t-shirt (Skye). Miss E. went for the bling (also Skye). I think Miss N. was a little closer as Skye is all about nature and the outdoors, (like Miss N.). Miss E. is all about the sparkle and shine! - Flight from RDU to NYC - The girls and I got dropped off by DH. Made it through security fairly painlessly considering that I over packed (as usual). We grabbed lunch, then our flight. The girls were giddy with excitement and goofy the entire way up. - Arrive in NYC; Picked up by shuttle (We got to share a ride with Melissa and her girls from "Your Fun Family" and Anne and her daughter "Drama Queen" from "The Megalomaniac Mommy"). - Go to room; settle in, freshen up and get ready for the welcoming party! - Walk the Pink Carpet - Arrive at the reception area and meander over to the Pink Carpet! The girls were interviewed, filmed and photographed. Once their interviews were complete, we entered the banquet room for the main event. - Introduction - Most of us did our homework beforehand, but we learned more about the pixies and discussed who our favorites were. We then had a brief overview of what crafts were available in the Pop Art Pixies line. - Ice Cream Bar! - finished the evening with an ice cream bar while we finished our crafts. - 52nd floor - Anne stayed on the 52nd floor of the W hotel and told us we had to come up to their room to see the view, so we did. On the way up our ears popped and I got dizzy when going down the hall. When we got to their room it looked identical until you looked out the window. I could not believe the view! I also cannot believe I did not pass out. I am deathly afraid of heights. - Times Square - Anne, Melissa, myself and our girls ventured down for a walk around Times Square. We went to M&M world, where I spent a ridiculous amount of money on 2 toys. Our other big purchase were 2 hats for $5 each from a street vendor. This was our best purchase - the girls would not take these off their heads. Stopped at a deli next door to our hotel - the girls grabbed chips and I grabbed sushi. (I just LOVE that in NYC you can get sushi at the deli LOL). - Hotel - BED! and a voice mail message from the Pixies. The girls put on their PJs, and for some reason their new hats. They checked the voice mail and them climbed into bed. Both fell asleep the minute their heads hit the pillow, hats and all. - Rise and Shine - Get up, shower, and get ready! 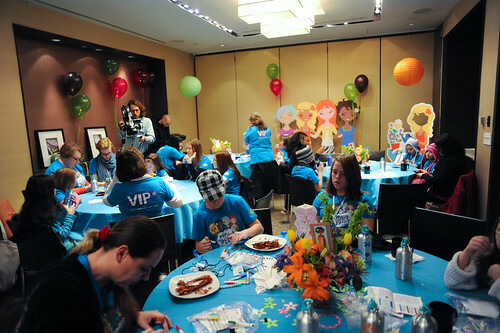 - Breakfast - We went back to the banquet room by the pink carpet. We immediately found Anne and her DD (aka the Drama Queen). Breakfast.... We are in the far back, right corner. - Par-tay Bus - Our bus was awesome! The outside was decked out in images of the pixies and the Pop Art Pixies logo. The inside of the bus was just as fun - white leather seats, neon lights, music, snacks and beverage. 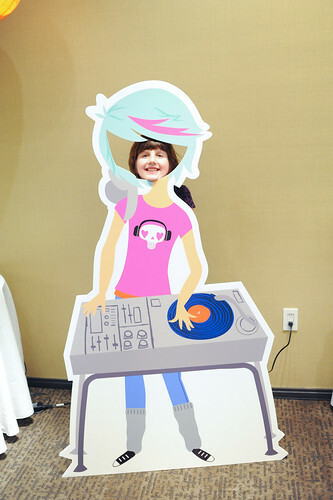 I did not receive monetary compensation for this post. 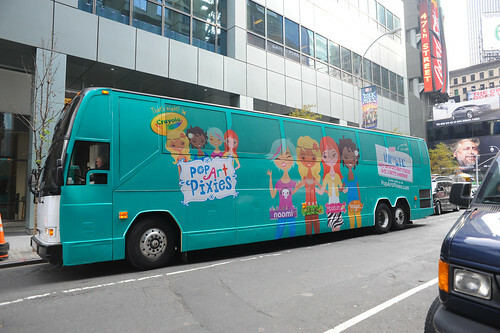 Crayola is providing the giveaway, invited us to NYC for the special event and paid all costs. I was not required to write a positive review. All opinions expressed are my own. For more information on this blog and on my posting practices, please refer to the disclosure policy at the bottom of the page.